The duties of elected officers are outlined in the bylaws. Duties not specifically mentioned in the bylaws can be found below. 1. Issuing periodic general calls for papers though outlets such as H-Net, listservs, and other media sources devoted to the study of popular/American culture. The chair should also make flyers to distribute at appropriate conferences he or she attends in advance of NEPCA. 3. Working closely with area chairs, the president, the executive council, and the executive secretary to solicit proposals. 4. Collating all proposals and fashioning them into tentative panels, which will be refined at a summer planning meeting for the fall conference. 5. Working with area chairs to issue needed follow-up calls for papers to round out incomplete panels. 7. Helping NEPCA defray costs of the conference. In most cases, the chair lobbies to have meeting space donated. The more services that are donated or discounted, the better as NEPCA must earn all its operating costs from the conference and membership fees. (See document—Conference Costs). 8. Assembling the final program and arranging to have it printed and available at the registration table for all conference attendees. 9. Recruiting volunteers and/or students to assist with conference registration. The chair works with the executive secretary on these matters. The chair should also make certain that the Local Arrangements Chair has signposted clearly all buildings and parking areas used during the conference. 10. Coordinating with campus security and tech specialists in advance of the conference, and securing things such as approved parking for attendees and login codes needed to use classroom technology. It is generally a good idea to secure a tech specialist for the conference, or some other individual with the expertise to resolve any technological problems. 11. Arriving early before the start of each conference day to make certain rooms have been unlocked, that catering has arrived on time, that volunteers are in place, and that classroom technology is online. There should also be several tables set up for book displays and other materials. At least two (preferably three long tables) are needed for registration. 12. Acting as receiver for any books sent by publishers who want their wares displayed at the conference, but who will not attend in person. (Said publishers will have been told that NEPCA does not return these items and that will be considered donations.) The chair will also provide logistical support for vendors that are attending in the way of display tables. (They are responsible for their set up and removal.) Chairs often find it useful to invite local publishers or vendors to display at the conference. 13. Working with the executive secretary to make certain that all vendors and contracted workers are paid in a timely fashion. The chair should keep careful account of all incidental expenses (pens, badges, signs, etc.) so that these can be reimbursed. 14. Reporting all conference no-shows to the executive secretary. 15. By custom, the program chair becomes the new president of NEPCA upon the rise of the conference. The chair can decline, though the NEPCA presidency is generally viewed as an honorific award for the labor of having served as program chair. 1. Solicit proposals in your area for the upcoming NEPCA conference. These proposals should be sent to both you and the conference Program Chair. Get details on the upcoming conference. 2. Advertise regularly for proposals. A good place to do this is on H-Net. We strongly recommend you post monthly Calls for Papers on H-Net. You can send notes to H-Commons. It currently uses a system called H-Announce for Calls forPapers, but the H-Net site is periodically updated, so be sure to double check on its current polices. We also encourage you to send out flyers to outlets you may know of. 3. As you receive proposals, evaluate them for worthiness and recommend to the Program Chair whether or not the proposal is worthy of inclusion in the fall program. Please note: The program committee makes the final call on accepting or rejecting proposals. We almost always accept the area chair recommendation, but sometimes have to reject papers that don’t fit into a conference panel slot. Please advise applicants that they will hear from the Program Chair by early July. 4. If you have enough good proposals to fashion an entire panel (generally, this would be three 20-minute presentations), recommend that panel to the Program Chair. Complete panels are almost always accepted in their entirety, though we request that not all panelists come from the same institution. 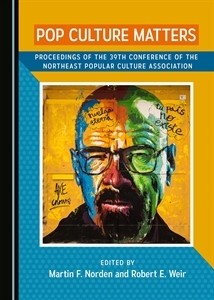 The Northeast Popular/American Culture Association (NEPCA) is seeking paper proposals on the topic of [subject area] for its fall conference to be held at [location] on [date]. Please send electronic versions of your proposal to: [Use the URL for the current year’s Google form] See complete details. NEPCA presentations are generally 20 minutes in length and may be delivered either formally or informally. NEPCA prides itself on holding conferences which emphasize sharing ideas in a non-competitive and supportive environment involving graduate students, junior faculty, and senior scholars. Write at least one review (600-900) words of one of the books you evaluate before August 1 for publication in the fall issue of NEPCA News. 1. Before you read, make certain the book is eligible for the Rollins Prize. The author must either live or teach in New England or New York or have done so in the past two years. If you are uncertain, ask the committee chair to check. 2. You need not evaluate any of the following types of books as they are ineligible for consideration: fiction, poetry, annotated works, edited collections, reference works, or text books. The books must also deal, in a substantial way, with popular and/or American culture (broadly defined). 3. Unless a publisher has special permission to nominate more than one book they must choose just one for prize eligibility. If you notice more than one from any single publisher please alert the committee chair. The committee chair should contact the publisher immediately and ask which one book they wish to have the committee consider. The chair may use his/her discretion to allow a second book, but should do so only if both books are, in the chair’s opinion, equally worthy of consideration. 4. We suggest that you read each eligible book as it comes to you, especially given that some publishers send books as the deadline looms. a. Scholarship: Is the work solidly researched? Is the author aware of other works on this topic? Does the author use credible and/or germane sources? Does the work add anything new or important to the fields of popular and/or American culture? Is the work original, or merely parroting what others have said? c. Appeal to NEPCA Membership: Would this book appeal to NEPCA’s broad-based membership? Could it be used in the classroom? Does it reveal things our members need to know? Is this an important book? 6. The chair will compile the ratings of all committee members and the point total determines the winner. In the event of a tie the chair will ask each committee member to rank the tied books. If there is still a tie the chair will cast the deciding vote. 8. The chair should write or assign a review of the winning book (400-750 words) and get this to the newsletter editor before August 1. 9. Each member will write a review (400-700 words) of one of the books and submit it to the newsletter editor before August 1. The chair will coordinate the assignment of reviews, but members should alert the chair immediately if there is one they want to write. The chair has guidelines for reviews and will forward them to committee members. The book committee’s role is to serve as peer reviewers for any review under consideration for publication in any NEPCA forum. Committee members also suggest edits, raise author queries, and alert the editor of any concerns they have about the review. Reviews will be edited and forwarded to authors to address queries and/or approve of edits.